What a morning! I'll begin with a warning that there is quite a bit of blood in this post... So it may not be for the squeamish. It all started out so perfectly. We have the Catholic Children's Treasure Box book series and have been doing "school" a bit more formally lately. Sadie was pretty thrilled to discover that the first story in the first seven books is about Saint Therese, and has been enthusiastically learning about her favorite saint. We began our day with an early morning walk. We walked a mile to a park bench, sat and had a snack, and I read to the girls while they ate their rice cakes. Then we headed back to the park, where Sadie played in the sandbox while Mae Bae handed me handfuls of wood chips (a favorite activity). And then, because it's a pretty warm day with a forecast of 81 degrees, I let the girls get into their matching pink bathing suits and set them loose in the water park. We were the only ones there and they had a great time playing and splashing in the water, and I was happy that it meant I wouldn't be bringing to sand covered girls home to the apartment. There was one spot in the middle of the water park though, that was slick and both girls slipped there several times before and I'd warned them to be careful... and then it happened. Sadie slipped and hit her chin on the ground. I ran across the park to her, and as she pushed herself up I saw blood pouring everywhere. Puddles of blood. I thought that she'd knocked her front teeth out, but quickly saw a large gash where her top teeth had gone through her tongue. I managed not to get sick or faint and began to try to figure out what to do. Paul was across town at the court house and I didn't have a car. The ER was three miles away. Blood poured everywhere as I scooped her up, grabbed a towel, put her in the stroller and put a fighting Mae in the stroller, vaguely realizing we were all covered with blood. Sadie cried and told me that she didn't want the blood getting on her princess bathing suit tutu. I told her I'd wash it and marveled that she was worried about one of her "princess dresses getting dirty" even then (she's very careful with them). Thankfully just as I got the girls in the stroller Paul called and I told him we were going to the ER. The bleeding had slowed though, and I didn't think we needed to call 911. I rushed home and put a very pale Sadie in regular clothes, changed Mae Bae and packed some books and snacks in a bag, anticipating a wait at the hospital. We arrived at the hospital and were quickly seen. Everyone was wonderful. When the first nurse saw Sadie I think he doubted how bad it could be, because she was sitting calmly on my lap, and in fact, I was beginning to doubt it too (the pictures doesn't really do the wound justice, because her tongue isn't at quite the... gapping... angle that best shows the hole...). Then he asked her to show him and pretty quickly brought us back to the doctor. 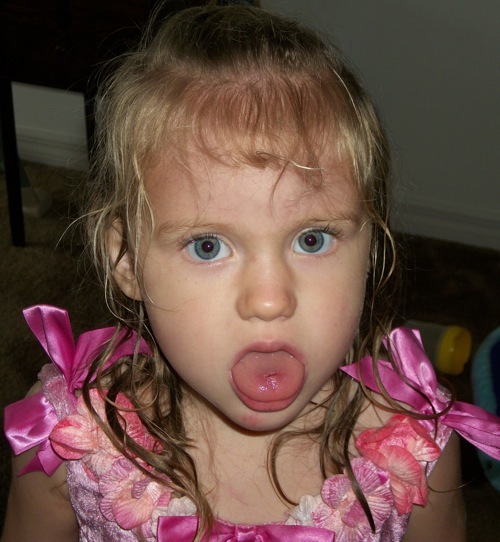 Sadie showed everyone, and tried to curl her tongue so that they could see the bottom of it. Ultimately she did have to be held down for them to make sure the bottom wasn't badly damaged (it wasn't). The doctor who saw us was actually the very nice doctor who saw me when I was so sick after the miscarriage. He gave us lots of instructions on what to do and said not to hesitate to bring her back if my instincts told me it was getting worse, although he expects that it will heal nicely. And so we are home. Sadie and Mae sister both enjoyed strawberry Popsicles (I see a lot of Popsicles in Sadie's future) and Sadie is feeling better after the generous dose of Tylenol we were told to give her. We're taking the day off of doing anything and watching princess movies. Today has been eventful enough already! My prayers for a fast healing for what is truly awful looking! Poor baby!!! That is a very painful looking wound, for lack of a better word. Here's hoping and praying for a quick recovery; kids are so resilient. Glad she's ok Cam, how scary! Oh my goodness! Poor thing. Your little family has been through so much these past few months! I hope things calm down for a while! I bet if you never see another ER it will be too soon. Prayers for you guys! Poor Sadie! That must have been scary for both of you! Hope she feels better soon! Poor Sadie! Did she end up needing any type of stitches or anything? I'll pray for a quick recovery for her! On a side note, I love the Catholic Children's Treasure Box books! I only have books 2,4 and 6 because I got them at a thrift store. When I saw copyright, I assumed that I would not be able to find them anywhere else anymore! I am so excited for the link you shared on your post. Thanks! Poor little bunny, that looks awful! Oh wow...poor little girl...that looks painful. Prayers it heals nicely without any further issues. Poor Sadie! I hope her tongue heals up quickly. I'll pray that she heals fast. Ouch! Poor Sadie! 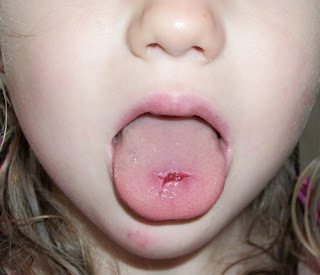 My husband bit through his tongue like that when he was a kid. Still has the scar, but everything healed up nicely. Oh my! Hope she's feeling well and that Tylenol is still doing its job. Prayers for all of you. Oh Lord! Thankfully it didn't go all the way through! That would have been a really bad trip to the ER. Thankfully she's alright. My, that must have hurt!